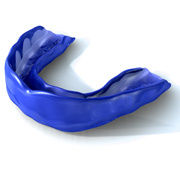 Sports guards are custom mouthpieces that patients can wear to protect their teeth when they participate in sports that carry risks of physical impact. In many cases, members of sports teams are required to wear sports guards during practice and competition. Our Los Angeles sports guards expert offers custom sports guards to children and adults as a valuable investment for their oral health and protection of cosmetic dental treatments, such as veneers, dental implants and bridges. Sports guards shield the teeth and jaws against trauma by absorbing the shock of physical impact from other players, obstacles and the ground. Furthermore, this shock absorption can help protect against concussion and brain trauma. By wearing sports guards from our expert in sports guards in Los Angeles, patients are also better protected against soft tissue injuries affecting the tongue, lips, cheeks and gums. Customized sports guards from our Los Angeles sports guards expert are made according to dental impressions taken at our office. Because the sports guards are constructed directly from these dental impressions, patients enjoy greater comfort than they would with store-bought ones that are designed to fit all users. Individual differences in oral structure are accounted for, ensuring that teeth are well protected at all times. Children and adults who participate in high-impact sports are ideal candidates for sports guards from our Los Angeles female dentist. Contact sports, such as football and mixed martial arts, often require participants to wear sports guards for their protection. Patients who ski or snowboard can also benefit from wearing sports guards in case of collision on the slopes. Our expert in sports guards in Los Angeles offers this treatment to ensure that patients are protected during activities that place their oral health and appearance at risk of physical trauma. Because customized sports guards fit properly when worn, patients who use them can continue to speak and breathe normally during events. To learn more about the benefits of sports guards and determine if they would carry advantages for specific activities, patients can schedule a consultation with our dentist.